Mini turbo oscillating sprinkler with "egg" timer. Pivoting oscillating spray head fully adjustable for range and width . 16 clog resistant spray nozzles for even water distribution. Gardena Turbo gear with switch mechanism provides even coverage without puddling. 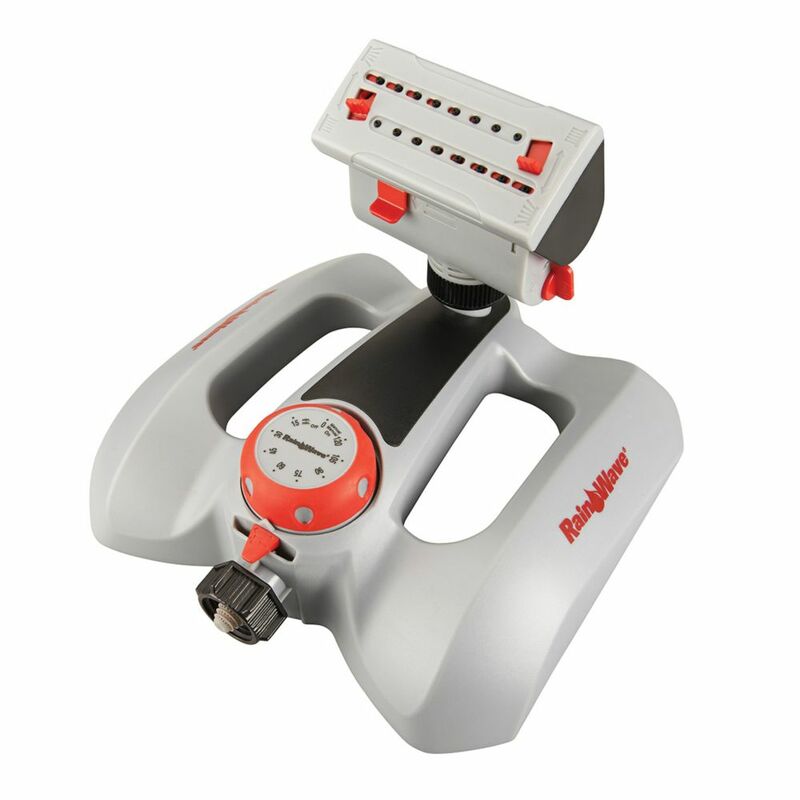 Precise control of watering patterns through infinite adjustment regulator. Longer life through deluxe gear box.. Adjustable range control up to 50'. The Melnor Turbo Oscillating Sprinkler is ideal for large lawns. The quiet turbo design provides a gentle rain that is great for newly seeded areas. Adjusting the range allows you to water just what you want. TripleSpray Oscillating Sprinkler. Offers three (3) dramatically different coverage options. The TripleSpray can water wide expanses, narrow strips and those in-between sections with equal efficiency. A simple twist of the spray tube lets you spray with 20 jets, 12 jets or 6 jets. Cover areas from 56 feet down to 8 feet in width. Innovative drive design ensures that no gears will be stripped when the tube is twisted. High-efficiency AquaDrive motor. TurboHeart Oscillating Sprinkler. The Turbos heart shaped cam reduces water waste by eliminating puddling at the end of the oscillation. Rezimar base with curved aluminum spray tube and 18 precision jets. Ergo swivel coupling. Mini Turbo Oscillating Sprinkler Mini turbo oscillating sprinkler with "egg" timer. Pivoting oscillating spray head fully adjustable for range and width . 16 clog resistant spray nozzles for even water distribution.